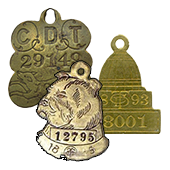 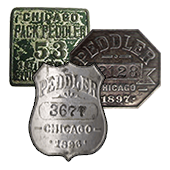 Representations of Chicago dog tax medallions issued by the City of Chicago. 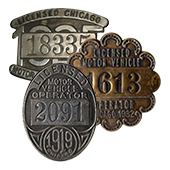 Representations of Chicago licensed motor vehicle operator medallions issued by the City of Chicago. 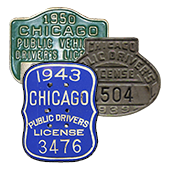 Representations of Chicago public automobile operator & driver’s license medallions issued by the City of Chicago. 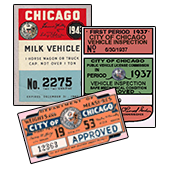 Representations of Chicago vehicle tax decals, also known as “City Stickers,” issued by the City of Chicago. 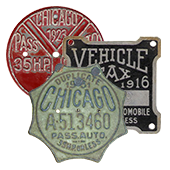 Representations of Chicago vehicle tax medallions issued by the City of Chicago. 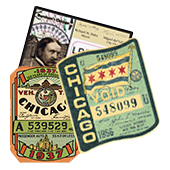 Representations of miscellaneous Chicago cards & decals issued by the City of Chicago and other organizations. 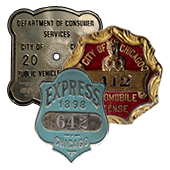 Representations of miscellaneous Chicago medallions issued by the City of Chicago.